Product prices and availability are accurate as of 2019-04-11 21:08:52 EDT and are subject to change. Any price and availability information displayed on http://www.amazon.com/ at the time of purchase will apply to the purchase of this product. DOGWOOD: The Dogwood species range anywhere from groundcover, multi branched shrub or tree, or a single trunk ornamental tree form. Dogwood trees are considered by many as the best all-round flowering trees. Dogwoods are most known for their outstanding display of flowers in the spring. Cornus kousa, also known as Kousa dogwood, Japanese dogwood, or Chinese dogwood, is a small, handsome specimen tree or shrub. This handsome little tree adds year-round beauty, for white flowers in May and June give a Milky Way effect, while purple and scarlet fall leaves add intense color. The beautiful tree form has horizontal branching. It is planted as a specimen, near a patio, or in groupings. The Kousa is not as susceptible to disease as the white dogwood in spring. Blooms later and with a softer-petaled flower than the white flowering dogwood. Because of its disease resistance, it is becoming the best replacement for the white dogwood. 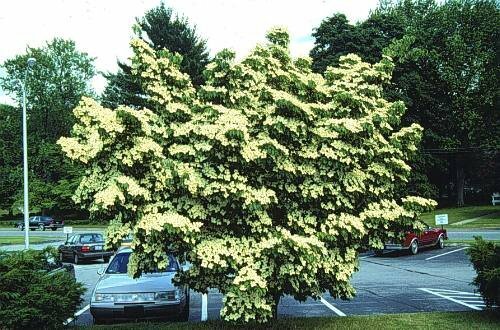 Kousa Dogwood has low water requirements and displays a moderate tolerance for salt and alkali soils. Partial shade to full sun. Grows to 15' to 25', 25' spread. Hardy in zones 5-8. In groupings plant 10-15' apart. 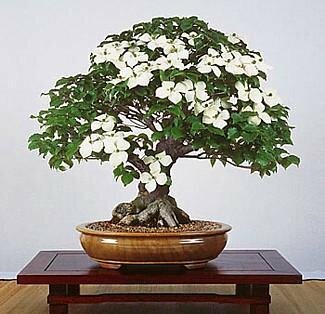 Kousa Dogwood also make an excellent and unusual blooming bonsai!